The famous Terracotta Army in Xian. The Terracotta Army was discovered in the spring of 1974 to the east of Xi’an in Shaanxi province by a group of farmers when they were digging a water well around 1.6 km east of the Qin emperor’s tomb mound at Mount Li (Lishan), a region riddled with underground springs and watercourses. The figures vary in height according to their roles, with the tallest being the generals. The figures include warriors, chariots and horses. 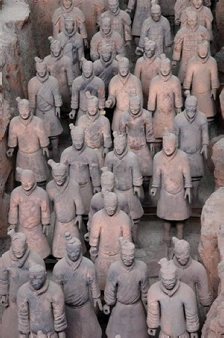 Current estimates are that in the three pits containing the Terracotta Army there were over 8,000 soldiers, 130 chariots with 520 horses and 150 cavalry horses, the majority of which are still buried in the pits.